Click here to receive a catalog by mail. 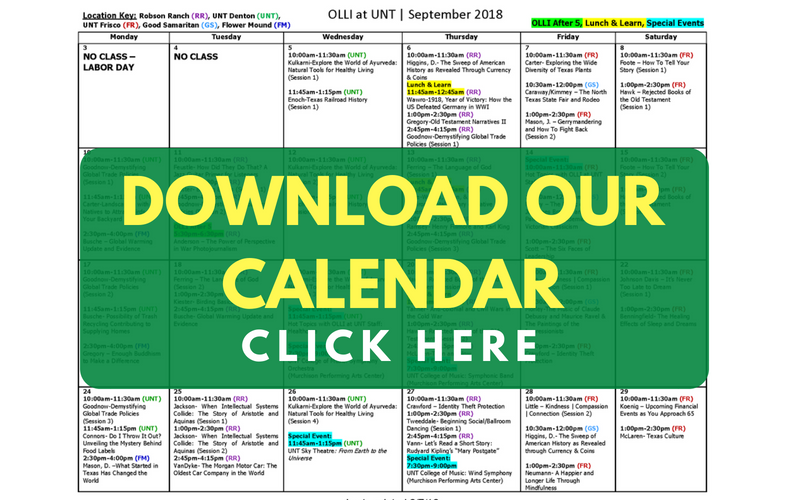 To enroll in courses and events, you must first be a registered OLLI at UNT member. To register as a member, click here. If you have a question about your membership status, please contact olli@unt.edu or 940-369-7293. Current Members: If you have already paid your membership fee for the year, you are eligible to enroll in courses and events. Please click one of the options below. Enroll in courses and events online using the Member Portal. Mail in a completed Enrollment Form. About 1.5 - 2 months prior to the start of each semester (Fall, Spring, & Summer), OLLI at UNT releases its catalog. Once the catalog is released, members may begin enrolling in courses and events. Members may add courses and events to their personal schedule throughout each semester. Enrollment prior to each event or the first session of each course is required. What are OLLI at UNT courses like? We offer courses at five locations on Mondays - Saturdays. All of our courses are offered during the day. Most courses meet only once during the semester, for a session that lasts 90 minutes. Courses with more content may continue for up to 4 sessions, with each session lasting for 90 minutes. Courses are scheduled based on the faculty member's availability. Courses are generally lecture style, followed by Q&A. Courses may also have an experiential format, such as a guided tour of one of the university's special collections. Members do not receive tests, grades, or mandatory assignments. There are no prerequisites. Members can enroll in any of the courses offered at any of our classroom locations. What are OLLI at UNT events like? We partner with UNT's Sky Theater to offer regular planetarium film screenings that are complimentary for OLLI at UNT members. UNT's College of Music generously offers complimentary tickets for select Symphony, Orchestra, and Choral concerts to OLLI at UNT members. They also offer discounted tickets to select Opera concerts. We send notification to all members as soon as we receive the list of selected concerts each semester. Lecture at the Kimball Art Museum in Ft. Worth with dinner at the Riata restaurant. Texas Tulip Farm in Aubrey (tulips included) with lunch at Mom's restaurant. IMAX film screenings at the OMNI Theater in the Fort Worth Museum of Science & History including lunch at a local restaurant. The OLLI at UNT Day Trippers Special Interest Group plans day trips to supplement our other event offerings. These trips are primarily designed for members who are interested in connecting with others with whom they can travel to visit local attractions. The cost for these trips is generally limited to whatever entrance fee is charged at the door of the attraction. Members are encouraged to arrange carpools with their fellow members to travel to these attractions. Other events are offered based on input from our Curriculum Committee. The price of other events will vary. However, we offer complimentary events whenever possible. How does OLLI at UNT choose the courses and events it offers? Anyone is welcome to submit a course proposal by using our online Proposal Form. OLLI at UNT reaches out to all UNT faculty to encourage them to propose courses. We also reach out to those who have taught for OLLI at UNT in the past to propose new courses each semester. We also accept suggestions for potential courses from members. If you know someone who could teach a course for us, please contact olli@unt.edu or 940-369-7293 and we will be happy to contact them to encourage them to propose a course. Our Curriculum Committee, composed of OLLI at UNT members, meets prior to each academic semester to review course proposals. To learn more about the Curriculum Committee, click here. Lunch & Learn Lecture Series: Each semester, we partner with one UNT Department to feature lectures by their faculty. OLLI After 5:00 Lecture Series: OLLI at UNT's director personally curates the speakers for this lecture series. Enrollment questions? Contact olli@unt.edu or 940-369-7293.